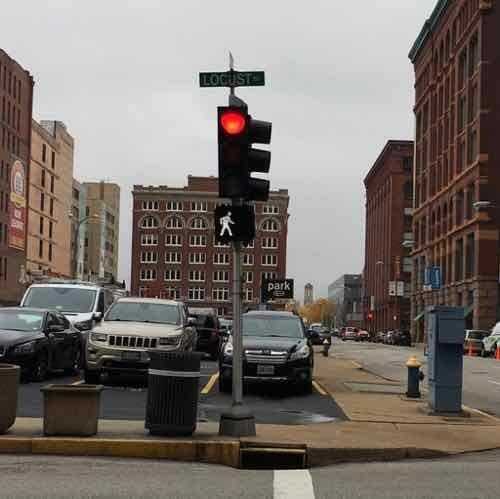 A significant change has been happening at St. Louis intersections: the leading pedestrian interval (LPI). The what? Walk signal is on while the traffic signal is still red, 11th @ Locust. The FHA says the benefit is a 60% “Reduction in pedestrian-vehicle crashes at intersections.” Video I took last month shows a 3-second LPI. Hopefully busier intersections (pedestrians & cars) get 7 second LPIs. Still. 3 seconds is better than 0! I’m not sure if an LPI is used anywhere in St. Louis County, or the rest of the region.